I promise you that this will not turn into a cat photo blog, despite this now making two posts in a row (half of my December output, no less) with a feline visual focus. Kathy and I fly back to LA on Tuesday and the cat stays here. That said, I just took this shot with the cat sitting on my lap. My 50mm lens has a minimum focus distance of a little under a foot and a half, so to take the shot I had to hold the camera well off to my side and completely guess on focus and aim. 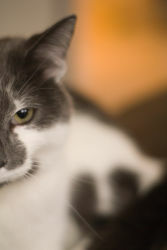 The shot was taken at f1.7, which is what accounts for the super shallow depth of field. I fear I might be turning a bit obsessive monitoring the used lens market on eBay. I haven't found any great deals there yet, though. So far KEH has appeared to be the place to look for second-hand Minolta glass. A week or so before heading back here to MI for Christmas I bought myself a present: a Sony A100 dSLR. I've coveted a dSLR for a while now and hadn't acted on that, but finally it seemed time to go ahead. After playing with a Canon 20D for the weekend and then handling both the Sony and the Canon Digital Rebel XTi in the store I ended up going with the Sony. One of the big determinants in my decision was that there are tons of second-hand Minolta lenses available that work on the A100 and can instantly take advantage of its in-body stabilization. Yesterday I got my first additional lens, as my parents gave me a Minolta 50mm 1.7f. With the A100's smaller than full frame sensor that makes the effective length of the lens 75mm, right in the sweet spot for portrait shots. It's the first time I've shot with something that could do so much with available light, and the shots I took of family opening presents turned out great. 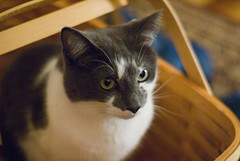 Instead of posting those, though, I've posted this shot of the cat sitting in a basket my mom got for Christmas. It's amazing how well a cat will sit still for photos when there isn't a flash going off in its face. Two years ago I had a meeting at my apartment and one of the attendees brought a box of Pocky and some "Drink It Black" cold coffee. Both were enjoyable. Somehow, though, it wasn't until today that I walked over to Famima!! and picked some up again. Time really does fly. Anyway, if you ever have the chance go ahead and pick up some Pocky. It's like a cookie in stick form. I ordered a Macbook the other day and it came in this morning. Back in January I made the move to a Mac at work, and over time I became pretty accustomed to getting things done on it. Particularly, I became so attached to TextMate that I really didn't feel like working on code in anything else. I'd fire up vim on my Linux desktop and it would be just like old times, but suddenly that wasn't enough any more. I'd also never found a Linux mail client that I could stand, to the extent that I would walk over to Kathy's iMac to check my email at home. So once the Core 2 Duo upgrade hit I ordered a 13" Macbook with the 2ghz CPU and 2gb of RAM. The laptop arrived this morning, and here I am later that same night working on a Ruby on Rails app in Textmate, running it via Locomotive, doing virtual desktops via VirtueDesktops, checking my mail via Apple Mail, and listening to music I bought off iTunes (Quincy Coleman's album Come Closer). I guess that's a conversion.